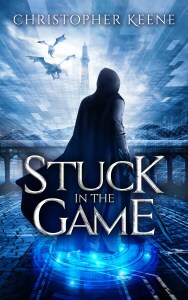 My novel STUCK IN THE GAME is now available on Amazon! Anyone who wants to buy it on sale for a few bucks, now’s your chance. For those who want a hard copy, you’ll be able to order it from Barnes and Noble very shortly. I encourage anyone interested in reviewing it to do so, no matter how critical a beating you want to give it. Being my first book, this is a big first step for me and I can’t express my appreciation for anyone who helps support it. Here’s the book launch page on Future House Publishing’s website. Click here for all the information on the book and how to get your hands on it. This entry was posted in Announcement, Bloggers, Fantasy, Gaming, Light Novel, Novels, Publishing, Review, Stuck in the Game, Writing and tagged Book Review, Cyberpunk, Fantasy, Publishing, Sci-fi. Bookmark the permalink. 4 Responses to Ready… Steady… Book Launch! Thanks I’ll make sure to bring that up with them.